The Watch Dogs Limited Edition Pack will release November 19th and retail for $129.99. You might say there's some anticipation for Watch Dogs. Despite being a new IP, retail sources reporting to Ubisoft have apparently pegged the game to be one of the most wanted titles coming to PlayStation 4 and Xbox One. Perhaps hoping to further wet the appetites of consumers itching to get ahold of the game, Ubisoft has announced a limited edition version of Watch Dogs filled to the brim with extra goodies for gamers to enjoy. 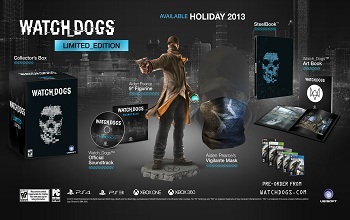 The Watch Dogs Limited Edition Pack will contain: a copy of the Watch Dogs game, a statue of protagonist Aiden Pearce, a replica of Aiden's vigilante mask, a collectible SteelBook game case, a copy of the game's soundtrack and an eighty page book of concept art. The Limited Edition Pack will be available on November 19th, 2013 for PS3, Xbox 360 and PC. Versions for the PS4 and Xbox One will also be made available at each console's launch. It will retail for $129.99. So what do you think? Is the additional merchandise included in the Limited Edition Pack worth the suggested price? Personally, seeing as we're generally fans of nice looking books we can flop down impressively on our coffee tables, the art book is a bit of a draw. That said, $129.99 is a lot of money to ask, especially when a few months and eBay could probably help you pick up a lot of the exclusive bits any ways.